However all I can see when managing a policy are General, Targets, Agent and System tabs. There are no Antivirus/Defense+ etc tabs as in the above screenshot. Am I doing anything wrong, why am I not able to manage Antivirus/Defense+ settings using CESM. I fear this is already answered (http://forums.comodo.com/endpoint-security-manager-30/no-firewall-in-cesm-t101242.0.html) but I would like to ask again. Why am I not seeing the Firewall option in the server. Windows Firewall is awful, it doesn't let me visualize rules very precisely, and doesn't show me active connections. Having used Comodo PC Firewall product for years, I was expecting to get same kind of usability on my servers too when deploying ES With AV and Firewall. 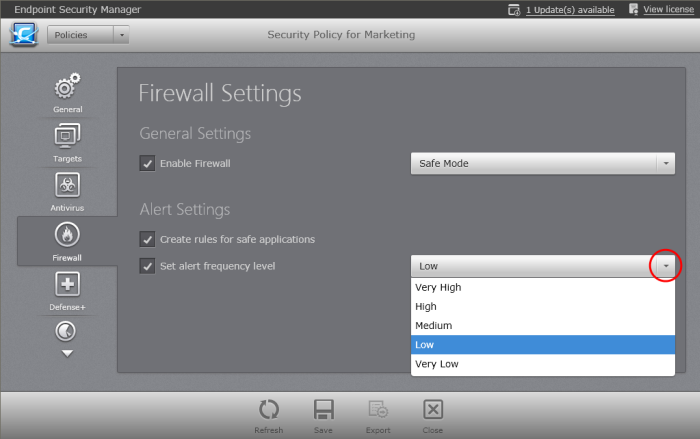 Is there a way to get a Comodo Firewall product installed on the server and use it instead of Windows Firewall. This comment (http://forums.comodo.com/endpoint-security-manager-30/no-firewall-in-cesm-t101242.0.html;msg734201#msg734201) says Firewall is not available for a Push installation. Does it mean if I download from CESM and then install, the Firewall would be available on the server? If yes, is it okay to do a manual install on the server if a push installation was already done earlier. 1.Please make sure ESM Agent and Comodo Antivirus for servers is installed on the server. Make sure the server is restarted once the Comodo Antivirus for servers is installed. If you have only the ESM agent installed, used the add->managed option to install it . If the option to install it is grayed out, you need to download the security packages Preferences->Packages->available packages. Try again to deploy the security package. If you already have deployed it, make sure the server is restarted. Once the server is restarted, create a policy based on your server. Even if you use push or manual install of CES/CAS , on windows servers it will install CAS without Firewall.